I love Texas. Over the years I've spent a good amount of time there. Texas is also very diverse. I mean, imagine, Aggies and Longhorns living in the same place! And those Texans, boy do they love their mascots. One thing I find a little strange about Texas is their trees. Seriously, how is that a tree? Even though I thought I knew a thing or two about Texas, I'm still learning. Last weekend I learned a couple of new things. First, those Texans are punny! Actually, getting that picture was a really funny story and it led me to the second thing I learned last weekend. Jenn was driving me through the countryside when we saw that sign. Being the blogger that I am, I just had to get a shot of it, so Jenn turned around and went back. We headed back down the road a bit and then had to turn around again, so we pulled into the parking lot of a small store. Interesting place, I thought. 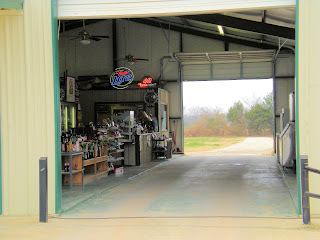 There were two garage doors, one on each side, and a place to drive into the building, kind of like an oil change place. As I was looking at the building, trying to figure out what it was, it hit me. The bottles lined up on one side, the ice chest on the other, and the Miller Lite neon sign kind of gave it all away. "Is that a . . . it couldn't be . . . a DRIVE THROUGH LIQUOR STORE?!" I nearly screamed at my sister. "Yeah, haven't you seen one of those before?" Jenn nonchalantly answered. Only in Texas, my friends. Only in Texas. Of course, there was one photo that got away--a picture that would go so perfectly with the one above. As we were speeding down the highway (another thing I know about Texans--they drive fast!) I saw a sign unlike any sign I had ever seen before. It read: "Beer To Go." What?! Where's that camera when you need it. "Yeah, ah, give me a Big Mac, some fries, and a beer to go." We actually have those "drive through" beer joints here in TN, too. Maybe it's states that begin with the letter "T" ....? You are so funny! I recognize the little mascot! :) Love your blog. Keep it up... Your friend, a "true Texan" and proud of it!